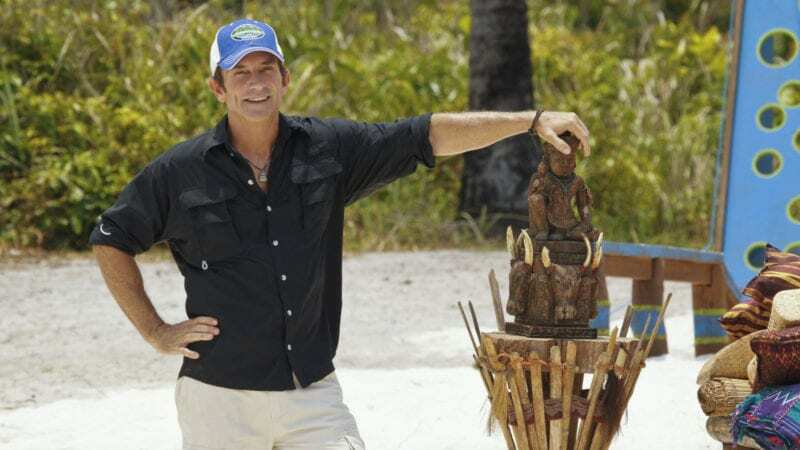 Host and executive producer Jeff Probst on SURVIVOR: KAOH RONG -- Brains vs. Brawn vs. Beauty. The show premieres with a special 90-minute episode, Wednesday, February 17 (8:00-9:30 PM, ET/PT) on the CBS Television Network. Photo: Robert Voets/CBS Entertainment ÃÂ©2016 CBS Broadcasting, Inc. All Rights Reserved. Jeff Probst is not only executive producer and host of Survivor and author of the Stranded book series, he’s a Traveling Dad as well. Jeff’s stepson and stepdaughter are regulars on Survivor shoots and, at 12 and 9, are expert travelers themselves. This Traveling Mom was thrilled for the chance to chat with Jeff about what he has learned from so much time traveling with kids. 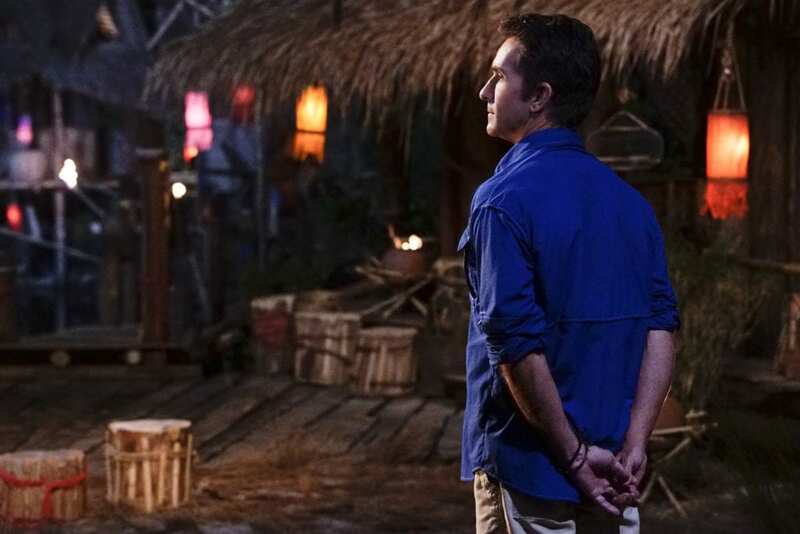 Host and executive producer Jeff Probst on SURVIVOR: KAOH RONG — Brains vs. Brawn vs. Beauty. Photo: Robert Voets/CBS Entertainment ÃÂ©2016 CBS Broadcasting, Inc. All Rights Reserved. How else can I explain the email asking if I wanted to interview Survivor host and executive producer Jeff Probst? Who, me? The mega-fan who has seen every episode since Richard Hatch strolled around in his birthday suit in season one? Half of a couple who, pre-DVR, scheduled long distance phone dates for Thursdays at 8? The girl who took a vacation to Contadora Island, Panama, just to see where Rupert “The Pirate” stole everyone’s shoes in season seven? Yeah, sure. 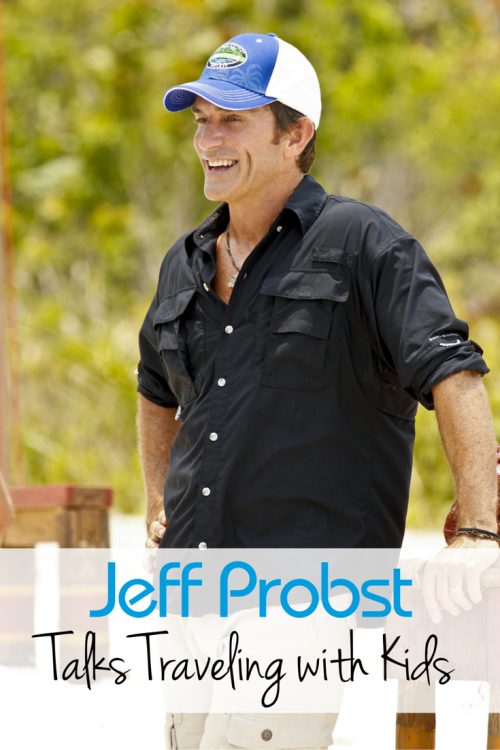 I’ll interview Jeff Probst (desperately trying to sound casual). Fortunately, Jeff took the fan-girl swooning in stride and we quickly got to chatting about what we have in common: traveling with kids. 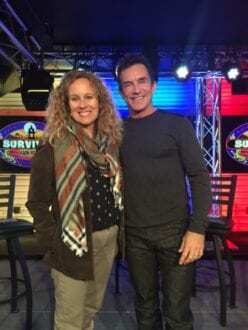 His wife and stepkids, ages 9 and 12, accompany him on Survivor shoots and Jeff had some terrific insight to share with Traveling Mom readers. You started traveling with kids when your stepdaughter was 5. What changes did you notice when kids got added to the mix? JP – The first thing I learned about travel with kids I learned from my wife: be prepared for anything. I was watching Lisa, my wife, pack a carry-on bag with books, games, snacks, wet wipes… and as a new dad I asked “Do we really need all this?” But on a five, six, even 13 hour flight with Survivor, one of the key things I learned is that you do have to be prepared. It’s a metaphor in general: you’re going on an adventure where you have to be prepared for all sorts of things but it really does start with that carry-on bag. Many of us at TMOM are SURVIVOR fans, and it looks like Jeff is a fan of ours too! Here the Survivor host poses with TMOM founder Kim Orlando. Photo by Beth Feldmana carry-on bag with books, games, snacks, wet wipes… and as a new dad I asked “Do we really need all this?” But on a five, six, even 13 hour flight with Survivor, one of the key things I learned is that you do have to be prepared. It’s a metaphor in general: you’re going on an adventure where you have to be prepared for all sorts of things but it really does start with that carry-on bag. What are your carry-on bag must haves? JP – The two essentials right now (at 12 and 9) for a long plane flight are electronics and plenty of snacks. Our go-to snacks are an assortment of bars, beef jerky, carrots and apples…we don’t tend to bring candy as we’ve learned you need actual food to get you through the flight. We’re also not the parents who think electronics are the death of kids. Electronics are a part of our everyday life. Our kids are born into a world of technology. We monitor it, but on a 13 hour flight I definitely want them to have their iPads. How much are you actually roughing it on location? JP – It’s not always pleasant! Since I’ve become a stepdad, the presence of global warming has become more and more clear. Our kids have been to locations where we’ve just missed tsunamis, drought in Nicaragua, extreme heat in Cambodia…our kids are very used to roughing it. There’s nothing pleasant about the weather on a hot, hot beach but the adventure they get overrides it. For instance this season in Cambodia: we were on an island in the middle of the ocean. That’s it. There’s no McDonalds, no Four Seasons, not even a local bar. You have what you create and you make the fun based on your imagination, your friendships, and playing music together, telling stories. There’s not a lot of diversion. But what’s nice about that is that you focus on the task at hand: we focus on making Survivor and live like a band of gypsies. We come from completely different walks of life: there’s probably 20 different countries on our crew and they each bring their own cultures and style of music. Some are surfers, some are into yoga, some are traveling the world. The most interesting thing I’ve noticed is that if we’re in Los Angeles and it’s raining, our kids are as likely to say “let’s not get wet” as “let’s go out and play in the rain.” But when we’re on location, they’re muddy, their fingernails are filthy, their shoes are destroyed and they want more and more and more. There’s something about that call to adventure in all of us that I see in our kids. The minute they land they’re different people. (Question from my 9 year old daughter) What were your favorite locations? Where would you suggest families visit? JP – Over 32 seasons we’ve been to so many amazing places! I can think of two very different experiences but two I’d go back to in a heartbeat. One of the most incredible experiences was in Kenya, Africa (Season 3) because we just camped out in a game reserve. Every morning we woke up literally there was a safari going on ride outside our tents! We’d quietly zip open our single person tents so as not to scare the animals and see five zebra, or a herd of giraffe…looking back on it now, it was incredibly dangerous! But it was such an awesome experience. At night we’d bring our cots out of the tents because it was so hot and the stars looked so close that you could jump up and touch them. An African Safari grounds you to the Earth- it just all made sense in a way I can’ t explain. On the other hand you’ve got somewhere like Palau (Seasons 10 and 16). The ocean is clear as far down as you can see. There’s world class scuba diving- shipwrecks from World War II and war planes you can just circle around. And Palau is a little city so you can stay in a nice hotel and eat in a good restaurant. (Question from my 12 year old son:) Are the kids allowed to be involved in the show? JP – The kids really do get involved in the show. Last season our 9 year old, who’s an artist, hung out in the art department. They handed her a paintbrush and after proving herself she was out painting challenges she could then see on TV. Our 12 year old followed the assistant directing team and grew enormously during the season. What happens when our kids come there is that the crew doesn’t treat them like little kids: put on a hat, slap on some sunscreen, and get to work! And as a result, their confidence builds. If you show you believe in your kids, they will amaze you. The Stranded book series for tweens carries on the theme that kids are capable of more then adults give them credit. 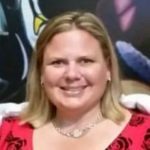 How did the books come about? JP – One thing I have learned through our kids- and they influenced Stranded heavily- was that little kids- 7,8,9,10,11,12- haven’t learned, they haven’t been taught, that they can’t do something. They believe they can do anything. And instead of saying ‘Well, kids, you’ll need an adult…’ in the books we said let’s let four kids figure it out. When I meet Survivor fans- 4th,5th,6th graders- and I ask if they can do this, they never hesitate. They never say ‘I’m not sure, you know, well my social skills, my athletic ability’…they just say ‘YES’. Explanation point. Really? You think you can make fire? ‘Absolutely’. You can build a shelter? ‘I know how to build a shelter!’ Because they just believe it. When we were in Nicaragua I shot a trailer of what a Stranded movie might look like. I used our kids and their cousins. We shot for 12 hours in the jungle. There were big thorns, spiky trees, animals everywhere, it was super hot…and at the end of 12 hours they were exhausted. We came back to the house we were staying in and there was no water. They were beyond filthy. They went out and jumped in the pool. I was listening to them laugh and retell the stories of what they’d just been through. And I looked at my wife (who came up with the idea for Stranded) and said ‘There it is! That’s Stranded! We just made them catch a fish, eat that fish, make fire, we had them do all these scenes and they loved it. As a fan, I have to thank you for a show all four of us enjoy watching together. It’s becoming harder to get us in the same room at the same time! It’s really rewarding to know young people are watching. One of the joys I get from Survivor is that it plays on so many levels. There’s this great adventure, there’s the vicarious thrill of imagining yourself out there but there’s also life lessons. Underdogs like John Cochran, who should never, ever, play Survivor yet did and won. If John can win, anyone can! Survivor: Kaoh Rong airs Wednesday nights at 8PM ET/PT on CBS. The Stranded book series for kids is available on Amazon. Previous Post: « Cherry Blossom Spectacular of Washington D.C.